This section is for completed software. 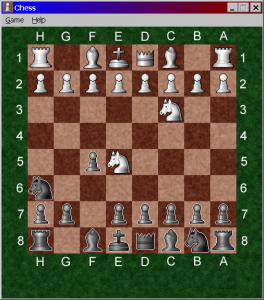 A simple chess game, with a point and click interface. Play as white or black. If you need help with the controls, go to Help->Controls. The saved game files are placed in a directory called “Save”. I will post the format of the *.cg save game files in the future. Note: Currently there is only a Windows version, but it should run ok in Wine. 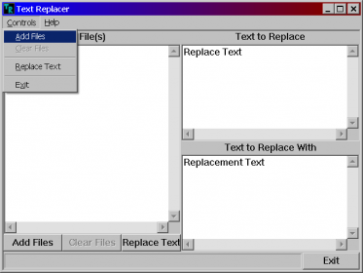 A program to replace text in plain text files. It works like the find and replace feature in Notepad, but it operates on a collection of files. Like the Chess game, there is only a Windows version. It might work in Wine, but I have not yet tested it. Also, there are a few graphical glitches that still need to be sorted out. Note: Be careful when using this program on important files. There is no way to undo a text replacement.